Michael Williams is a Commissioner on the Railroad Commission of Texas, which regulates the oil and gas industry. It is the state’s oldest regulatory agency. Elected statewide three times, he was elected to complete an unexpired term in November 2000. In November 2002 and 2008, they re-elected him to full six-year terms. Before he joined the Railroad Commission, Williams served as general counsel to Wilkins Group, Inc., a telecommunications company based in Richardson, Texas. He also has served in a volunteer capacity as the general counsel of the Republican Party of Texas, the chairman of the Texas Juvenile Probation Commission and on the board of directors of the Arlington Chamber of Commerce, the Texas Public Policy Foundation, and Our Mother of Mercy Catholic School. Williams is currently the highest-ranking African American in statewide Texas politics. He is the first African American to hold a statewide elected executive office in Texas history. 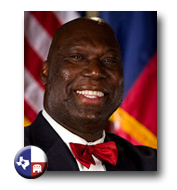 In 2008 Michael Williams announced that he would seek a position in the United States Senate, due to the current political climate and the possibility of a special election in 2009 to replace sitting senator Kay Bailey Hutchison. If he were to win the seat, he would be the only African American Republican senator. The Houston Chronicle has called Williams a "Senate Favorite," and the San Antonio News has called Williams a "Strong Contender for Senate." You can also follow Michael Williams on Twitter.